Christopher is an emerging theatre maker with a focus on socio-political content. 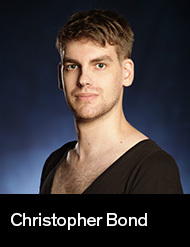 Christopherʼs major focus is the audience, and as a result will use any technique or process available to ensure the audience experience the production as intended. In 2015, he was Assistant Director of Angels in America Part 1 and The Art of War, written by Tony Kushner and Stephen Jeffries respectively (dir. Tom Healey, Flinders University, Drama Centre). He was also Director of Whoʼs Afraid of the Working Class (Flinders University, Drama Centre). In 2016 he was Assistant Director of August Osage County by Tracy Letts (dir. Nick Garsden, Flinders University, Drama Centre). In 2017, he was Director of 27 Wagons Full of Cotton by Tennessee Williams (NIDA and Actors Centre Australia collaboration); Trump! by Stephen Sewell (University of Wollongong, currently unpublished); and Untitled, devised by Georgie Adamson, Ang Collins, Camille Ostrowsky and the performers of Aboriginal Centre for the Performing Arts. Christopher also directed the music video clip for Bottled Water by Flower Drums (triple j Unearthed and NIDA). In 2018, he will be directing Samantha Donvito in her new work Aphrodite and the Invisible Consumer Gods, at the Adelaide Fringe.